Forest policy and institutional frameworks in all countries are fashioned according to their larger sociopolitical context, traditions and history. A major factor in shaping the historical sociopolitical context in the United States has been decentralization. At the time of their independence from England, the 13 original colonies entered the union as largely autonomous entities or “states” — and over time they have guarded this status jealously.2 In spite of this, over more recent decades, many policy and institutional functions have been centralized at national or federal levels. This trend has been slow at times — and has often been resisted by the states — with occasional attempts to reverse such centralization. Throughout the nineteenth century, United States policy encouraged rapid settlement and economic development of its western territory. To accomplish this, a variety of approaches were developed, including transfer of federal (public domain) lands to individual farmers, ranchers and corporations, especially railroad companies that built transportation infrastructure. After 1850, the population grew rapidly (20 to 25 percent per decade) and settlement of the western territories accelerated. Concerns began to be voiced over some of the environmental and economic implications of rapid development, including: (1) accelerated deforestation (forests were being cleared for agriculture at the rate of almost 3 500 hectares per day); (2) massive wildfires due to logging and land clearing (wildfires annually razed 8 to 20 million hectares); (3) extensive areas of “cut-over” land or “stump lands” remained unstocked or poorly stocked with trees for decades (estimated at 32.5 million hectares in 1920); (4) significant soil erosion by wind and water in some places; and (5) major wildlife depletion due to commercial hunting and subsistence use (Trefethen 1975; Williams 1989; MacCleery 1992). It was gradually recognized that these conditions were jeopardizing future economic development, as well as being concerns in their own right. Closing the public domain to further private land disposal and reserving the remaining public lands (most of which were in the western part of the country) for protection and management, as national forests, national parks and national wildlife refuges. Promoting and encouraging the protection of forests and grasslands — across all ownership categories — from wildfire, insects and disease. Improving natural resource management by acquiring scientific knowledge on the management of forests and wildlife and on the more efficient utilization of raw materials. Improving the management and productivity of both agricultural lands and forests through technical and financial assistance to farmers and landowners. Adopting and enforcing federal and state wildlife conservation laws. The rationale for public land reservation in 1900 was watershed protection and timber production. There were major concerns at the time that forest depletion would lead to timber shortages, even a “timber famine” (Williams 1989). In 1900, wood was considered an essential raw material for both industrial and domestic use. Given the long time frames associated with tree growth, plus the relatively low timber prices at the time, it was assumed widely that once the original forest capital was removed private landowners would not make the forest management investments that would be needed to assure adequate long-term supplies of timber for the nation.3 Therefore national forests were reserved to secure “favorable conditions of water flows, and to furnish a continuous supply of timber…” (1897 Organic Administration Act). By 1900, however, about 70 percent of the total national area of productive forests had already been transferred to private ownership and a decision was made not to transfer the remaining forest lands. Rather than transferring the remaining 30 percent of forest lands to private ownership or giving administrative responsibility to the states or local authorities, the United States opted for direct federal administration of much of the remaining public domain lands. This decision was a significant one which has, over the years, substantially affected the political dynamics under which these lands have been administered. The Forest Service, established under the United States Department of Agriculture, became the primary government agency for administering the national forests and supporting collaborative forest management across the country. Federally administered lands are concentrated in the western United States and make up about 261 million hectares. These lands contain approximately 100 million hectares of forest land — or about a third of all forests in the United States. The Forest Service administers 78 million hectares of land, or about 8 percent of the total area of the United States (Table 1). Sources: Based on USDA/ERS (2001) and USDA and USDI statistics. A professional line and staff cadre that was required to pass proficiency exams as a condition of hiring (Roth and Williams 2003). A set of core values and a common approach to problem-solving. These values were re­enforced by the curricula and cultural values taught in forestry schools. A decentralized decision-making structure with considerable discretion given to field managers. This reflected purposeful design, as well as the practicalities of the remote locations and poor communications that existed in forest areas at the time and the high variability of resources and local conditions. Previous requirements for upward reporting and approval that had existed under the Department of the Interior were reduced or eliminated (Roth and Williams 2003). A “promotion from within” policy, under which the agency prided itself that any professional employee with enough talent (and luck) could aspire to become the Chief of the Forest Service. For decades the Forest Service was characterized by a management philosophy established early on in its history. Until the 1970s, most Forest Service professional employees were foresters with rural American values who had graduated from forestry schools that taught curricula that re-enforced these values. While the agency had a highly decentralized decision-making structure, what emerged was a remarkably consistent approach to solving problems and viewing the world. In addition to the management of the national forests, the Forest Service was delegated responsibilities for forest management and wood technology research, and for providing assistance to private forest landowners. In cooperation with emerging state-level public forestry agencies, the Forest Service geared up to improve wildfire suppression and to provide technical and financial assistance to small forest landowners. By the 1920s, the Forest Service’s organizational framework was largely in place. This included three operational divisions: (1) the National Forest System (NFS); (2) Research and Development (R&D); and (3) State and Private Forestry (S&PF). This organizational structure remains today (Figure 1). Ranger districts, subdivisions of national forests, where most fieldwork is carried out. Regional Offices, providing an intermediate administrative level below the headquarters (there are nine regional offices in existence today). National Headquarters, located in Washington, DC. National forest lands traditionally and statutorily have been managed for multiple objectives such as timber, recreation, wildlife, water, grazing, mining and wilderness. The advantages of multiple use are that: (1) it provides administrative flexibility to shift management over time in response to changing public demands and preferences on public lands; and (2) it sets the stage for significant debates over preferred use, especially as competing demands become intense. In the 1970s, Forest Service Chief John McGuire remarked that the management of millions of acres of federal lands for multiple objectives in a modern, pluralistic democracy was a “grand experiment” and that “the jury is still out” with regard to the success or failure of the experiment. These words still hold true today. The management of the national forest lands — established in the midst of controversy — remains controversial to this day. National forest management from 1900 up to the Second World War was mostly custodial in nature. An early focus was to establish the boundaries of the national forests and to prevent, or respond to, unauthorized uses (such as illegal timber felling, unauthorized mining, agricultural encroachment). Another main focus of Forest Service efforts was reducing uncontrolled wildfires that were common prior to the 1930s. Curtailing the 8 to 20 million hectares that consistently burned annually, mostly on private lands, was considered a prerequisite for the long-term management of forests and grasslands — both public and private. The focus of these efforts was on protecting all lands from wildfire, regardless of their ownership; but systematic control became effective only during the 1930s, when large public employment programmes were established. 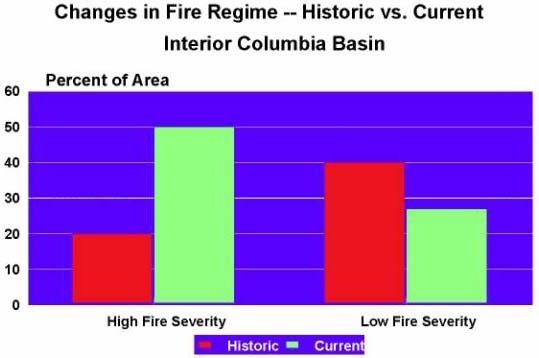 By the 1960s, the area burned by wildfire had declined by 90 percent compared to the 1930s (Figure 2). This was accomplished through highly successful federal, state and private landowner cooperation.8 Within the Forest Service, the State and Private Forestry Division was responsible for this coordination. Source: U.S. Wildfire Statistics, USDA/Forest Service. After the Second World War, there was substantial expansion in the demands placed on federal lands for a variety of products and uses. After the war, as millions of service men and women returned home and started families, demand for timber for housing rose dramatically. The nation increasingly looked to the national forests in the western United States to meet this demand (Steen 1976). National forest timber sale levels increased from a range of 9 to 13.5 million m3 in the late 1940s to 45 to 50 million m3 in the 1960s. By the 1970s, national forests were meeting about 14 percent of the nation’s total wood needs, and over 30 percent of softwood sawtimber — the primary source of lumber and plywood for housing (USDA/Forest Service 2004; Howard 2003). This substantial increase not only served to meet a critical national need for timber, it also took pressure off private forest lands, many of which had been heavily logged to meet war-effort demands (Fedkiw 1989). 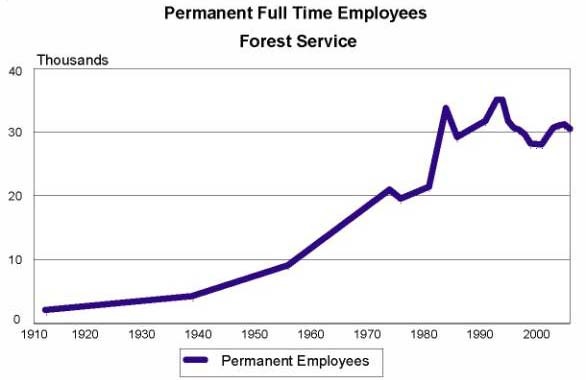 In order to gear up to expand national forest timber sales, the late 1950s and 1960s witnessed a major increase in Forest Service employees (Figure 3). From 1955 to 1975, the number of Forest Service employees more than doubled, from 9 100 to over 19 500 (Williams 2004a; OPM 2006). Most were foresters, with an increasing number of civil engineers after 1965, who were hired to prepare and administer timber sales and build roads. Sources: Williams (2004a); OPM (2006); HRM (2006). A 1960 book on public administration, The forest ranger, documented the Forest Service as a case study example of an efficient and effective public institution (Kaufman 1960). Kaufman attributed the Forest Service’s success to a sense of shared purpose, values and a common culture. Ironically, however, two decades later, the reputation of the Forest Service would be in tatters. The 1950s witnessed a substantial increase in demand for non-timber uses, outputs and values from national forests and other federal lands. Per capita personal incomes rose rapidly after 1940, rising from about US$2 000 annually in 1940 to US$26 000 in 2000 (adjusted for inflation) (U.S. Department of Commerce 2001). An increasingly mobile and affluent population began to look to national forests for outdoor recreation. Visits to national forests had increased from about 5 million in the early 1920s to 18 million in 1946, but surged to 93 million visits in 1960 and 233 million in 1975 (Census 1975 and 1994). The increased demands on national forests led to an interest in legislatively expanding their authorized uses from watershed protection and timber production as elaborated in the 1897 Organic Act. The Multiple Use-Sustained Yield Act of 1960 (MUSYA), which was hailed by the Forest Service as a significant accomplishment, gave the agency permissive and discretionary authority to administer national forests “for outdoor recreation, range, timber, watershed, and wildlife and fish purposes”. The passage of MUSYA created the impetus for multiple-use planning and the hiring of new specialists, such as soil scientists, to assist in integrating uses on the ground (Fedkiw 1999; Williams 2002). These multiple-use plans often zoned national forests into general administrative emphasis areas, but still required considerable on-the-ground coordination with regard to where specific uses (timber, recreation, wildlife, mining, grazing) were to occur and how conflicts were to be resolved (Fedkiw 1999). In 1968, the Wild and Scenic Rivers Act and the National Trails System Act were passed. These acts created separate systems within which rivers and trails with outstanding scenic, recreational, geological, cultural, historical, or other values could be designated by Congress into national systems, often after being proposed for such designations by federal land-managing agencies (DPC 1988). A Land and Water Conservation Fund was established, financed by oil revenues, to help finance the purchase of land in nationally designated areas. The growing environmental awareness of the 1960s continued to evolve into a general concern over the deterioration of air and water quality and the negative environmental and health effects of industrialization. Industrial air and water pollution were significant in and around most cities. Rachael Carson’s Silent spring galvanized public concern over pesticide use (Carson 1962). The first Earth Day (1970) successfully raised public awareness on environmental issues. Congress responded to these concerns by passing a variety of laws that addressed air and water quality as well as toxic control and endangered species. A primary focus of the environmental legislation of the 1970s was to reform the way federal agencies made decisions affecting the environment. The National Environmental Policy Act of 1970 (NEPA) required federal agencies proposing actions that could have a significant effect on the environment to evaluate a range of alternatives to the proposed action and come to a reasoned choice after providing the public with an opportunity for comment. Although only a procedural law, NEPA has had a profound impact on federal decision-making. The Endangered Species Act of 1973 (ESA) provided a statutory mandate for protecting species in jeopardy. It prohibited federal agencies from carrying out actions that might adversely affect a species listed as threatened or endangered. The ESA became a powerful tool that mandated that primacy in federal decision-making be given to endangered species protection, and, by extension, to biodiversity. More than any other law, the ESA was the genesis of the move toward “ecosystem management” on lands managed by the federal government. In 1974, the Forest and Rangelands Renewable Resources Planning Act (RPA) required the Forest Service periodically to assess the national long-term demand and supply situation for all renewable resources, and to plan how agency programmes would address projected resource demands and needs. In 1976, the National Forest Management Act (NFMA) provided detailed guidelines for the management of national forest lands and for increased participation of the public in national forest decision-making. Both the RPA and NFMA were intended to encourage planning and stakeholder involvement (Fedkiw 1999). It was hoped that the process could help to resolve the differences between environmentalists and timber, mining and livestock-grazing communities. This did not transpire. Many environmental laws in the 1970s authorized and encouraged individual citizens and NGOs to bring lawsuits to require federal agencies to enforce the laws. This encouragement included federal financing of citizen and NGO lawsuits against federal agencies.13 These statutory provisions substantially increased the role of NGOs as an element of environmental law enforcement and of United States courts in interpreting the “intent of Congress” in passing these laws. As many of these laws contain vague goals and standards, this has sometimes put the courts in the de facto position of setting environmental policy through judicial interpretation. The 1960s–1970s environmental movement had other subtle effects. One was generating interest among affluent young urban people in careers in conservation and natural resources. These “Earth Day graduates” have subsequently moved into influential positions in most federal and state land-managing agencies. Another major shift since the 1960s has been the movement of urban people to many rural areas adjacent to national forests. These former “urbanites” have caused a significant change in the preferences expressed by local people for how national forests should be managed. Many of these specialists were Earth Day graduates; although they were hired to assist in assuring compliance with applicable environmental laws, they also helped change the culture and values of the agency itself. These new employees eventually had a profound impact on the Forest Service. The use of clear-cutting timber harvest practices increased dramatically in national forests after the Second World War. By the 1970s, an increasingly vocal and well-organized public disliked the visual and other effects of prevailing timber-harvesting activities and sought political remedies to reduce them. Concerns over clear-cutting led to Congress recommending guidelines for the application of clear-cutting on federal lands, and eventually to the passage of the NFMA.15 Later, as clear-cutting greatly diminished after 1990, the focus of many environmental groups shifted to oppose commercial timber harvesting more generally. In addition to clear-cutting concerns, a second major public thrust was aimed at designating significant areas of national forest land as statutory “wilderness” or similar statutory categories emphasizing protection of natural values, recreation and other uses, and limiting or prohibiting commodity production. Between 1980 and 1985, Congress passed omnibus state-wide wilderness acts for 25 states (including most of the states containing national forest lands). The 1980s saw a merging of focus and linkage between concerns over national forest land management practices and wilderness designation generated by language in virtually all omnibus state-wide wilderness acts. This language prevented the Forest Service from considering any more additions to the National Wilderness Preservation System after completion of the first round of land management planning under the NFMA, but required such consideration when forest plans were revised ten to 15 years later. This dramatically shifted the focus of many environmental groups from “wilderness” designation per se to seeking to protect as much undeveloped and unroaded land as possible for potential designation as wilderness in the future. Issues emerging strongly in the 1980s that reflected this changed focus included concerns that the Forest Service was selling timber in some areas below its cost of production and the old-growth/ northern spotted owl issue in the Pacific Northwest (Fedkiw 1999). While both of these issues reflected important public policy issues, they also acted as wilderness “proxies” designed to protect the inventory of undeveloped and roadless areas. The late 1980s and early 1990s were characterized by increasing administrative appeals and lawsuits charging that the Forest Service was violating the NFMA, the ESA and other environmental laws. Such legal challenges became common and were successful often enough to delay several proposed timber sales and other projects and create uncertainty over national forest timber and other commodity programme outputs (Fedkiw 1999). In addition to public conflict, debate over the use and management of national forest lands was growing within the ranks of agency employees. In the mid-1980s, the Forest Service installed a new electronic communication system that linked its various field offices and line organizations. The electronic communications system, which was very innovative for the time, allowed for greatly improved internal communication vertically between organizational levels as well as horizontally among Forest Service employees. Soon several informal networks were established that allowed like-minded employees to share information and ideas on national forest activities and policies. These network dialogues became fora for internal debate and fostered a growing sense of solidarity and democracy within the ranks of Forest Service employees who disagreed with official policy and trends (and also among employees willing to debate the dissenters). Several of these fora became institutionalized such as the so-called “Eco-Watch” dialogues.16 To its credit, Forest Service leadership, although it may not have liked how official communications equipment was being used, did not systematically seek to stifle such dialogue. Other dissent was growing within the ranks, especially among forest supervisors. In 1989, at what was to become known as the “Sunbird” conference, 14 forest supervisors from the Northern Region (Montana and northern Idaho) provided an “open letter” to Chief Dale Robertson stating their view that existing national forest timber harvest levels were jeopardizing important resource values such as water quality, and were out of step with many national forest stakeholders. The letter was leaked to the press and created considerable attention in the media and in the environmental community. Scientists such as Jerry Franklin and Chris Maser began to promote a “new” style of forestry (or “New Forestry”) that would reflect the concepts behind this emerging research (Franklin and Forman 1987; Franklin 1989). This new forestry approach involved, among other concepts, leaving downed logs, standing dead trees, clumps of trees and other “biological legacies” within cutting areas. Franklin and Maser developed a broad media and environmental group following as they began to speak out publicly against the existing national forest timber-harvesting policies. By the mid-1980s the northern spotted owl took centre stage as the “poster child” for species thought to need large areas of old-growth and late-successional forest. As conservation biologists estimated that 1 000 or more nesting spotted owl pairs would likely be required to maintain a viable species population, protection of millions of hectares of old-growth forests was potentially needed to accomplish this objective. In March 1989, federal district court judge William Dwyer issued an injunction on the harvest of virtually all national forest timber within the range of the northern spotted owl (i.e. western Washington and western Oregon and northern California), and subsequently ordered the Forest Service to revise its standards and guidelines by March 1992 “to ensure the northern spotted owl’s viability”. This created an economic and political crisis. In June 1990, the U.S. Fish and Wildlife Service listed the northern spotted owl as “threatened” under the ESA, which required federal agencies to avoid any action that might jeopardize the species regardless of the opportunity costs or economic effects associated with not taking that action. In April 1991, the House Agriculture Committee convened its own panel, the Scientific Panel on Late Successional Forests, also chaired by Jack Ward Thomas, which issued its report in October 1991 (Johnson et al. 1991).20 The Scientific Panel report provided a number of management options with estimated timber sale levels and risk to the northern spotted owl and several other species associated with mature forests. The news from these reports was not good for stakeholders who wanted to maintain a high level of jobs in rural, timber-producing communities while also protecting the viability of the owl and other species. The earlier presumption of a high degree of compatibility between production forestry and the viability of all forest-dependent species was being unraveled by these panels. The adoption of the NWFP affirmed a process that had been ongoing for at least a decade, the gradual transfer of significant amounts of power in the Forest Service from line officers and foresters to scientists and agency resource specialists — and from the Forest Service itself to federal regulatory agencies and the courts. The 1980s and 1990s were particularly difficult for the Forest Service. Strong dissent came from external sources and from within its own ranks, both on national forests and within its research community. In the Pacific Northwest, protests became particularly strident, with vocal public demonstrations and acts of civil disobedience (such as tree sittings and vandalism of logging equipment and tree spiking). Between 1985 and 1993, environmental NGOs were successful in nationalizing (and even globalizing) the spotted owl/old-growth issue (Fedkiw 1999). On the other hand, the Reagan and the George H.W. Bush administrations resisted reductions in timber sales levels, as did the Congressional Appropriations Committee and other committees to which the Forest Service reported. But even without this political resistance in Washington, Forest Service leadership knew only too well the economic and social pain being suffered by scores of rural communities whose economies depended on national forest timber. Such economic pain was real and, in many cases devastating to the same communities that the Forest Service had encouraged to locate and grow next to national forests in the late 1950s and early 1960s, based on Forest Service promises of reliable supplies of timber for harvesting and processing. Tens of thousands of jobs in small rural communities were at risk. It can be claimed that the Forest Service’s sensors and early warning systems were not functioning well during this period — that they were not properly picking up signals from the urban public, environmental groups, internal agency sources and its own research community that substantial management changes were needed. Or if such signals were being received, perhaps the Forest Service was simply too inflexible to respond effectively to them. In reality, a cacophony of mixed and often conflicting signals was being heard — not just from those seeking change, but also from timber-dependent communities, the timber industry, ranchers, members of Congress and their staff, scientists and the duly appointed officials of the Executive Branch of which the Forest Service is a part. The challenge for Forest Service leadership in sorting through these signals — the “fog of war” — was indeed daunting. When Dale Robertson became Chief in January 1987 during the second term of the Reagan Administration, he expressed more interest in meaningful organizational re-invention than previous Forest Service Chiefs. He recognized that the Forest Service was under siege and needed to change. Chief Robertson began to openly encourage experiments in innovation and elimination of institutional hurdles by establishing re-invention pilots to reduce red tape and improve customer service.23 He allowed field units — if they adopted efficiencies that saved the agency money — to keep those savings to advance their own local priorities, even if those activities fell outside the budget line items where the savings had occurred (Kennedy School 1994). He often said that, “there are no failures, only learning experiences”. Dale Robertson further saw “New Forestry” ideas being advocated by Franklin, Maser and other scientists as a way to shift the course of the agency. He sought to institutionalize applicable parts of this evolving science and make it part of a Forest Service initiative. This came to be called “New Perspectives” (Salwasser et al. 1993; Kessler et al. 1992). Under “New Perspectives,” Robertson encouraged field managers to work with scientists to put practical shape and substance in field applications to the somewhat amorphous New Forestry concepts. Robertson was also concerned about the level of clear-cutting in national forests and the consequent erosion of public support. In early 1991, he made commitments to Congressional leaders to curtail the amount of clear-cutting in national forests. ... that we must blend the needs of people and environmental values in such a way that the National Forests and Grasslands represent diverse, healthy, productive, and sustainable ecosystems. 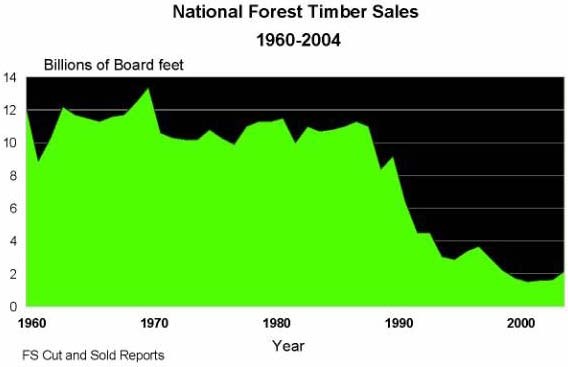 National forest timber sales had been relatively consistent between 1960 and 1989. After 1989, however, as a result of court decisions, public pressure and management plans imposed to protect the northern spotted owl and other endangered species, national forest timber sale levels went into free fall. Between 1989 and 2004, they dropped by more than 80 percent, from about 50 million m3 annually to between 9 million and 13.5 million m3 annually24 (Figure 4). When Thomas became Chief, he inherited an agency under siege. Many agency employees who had chosen careers in natural resources out of a sense of mission and conviction to conservation were feeling unfairly vilified by environmental groups and their sympathetic press. Thomas set about working to restore the agency’s self-esteem. Among others issues, he sought to institutionalize the meaning and content of the emerging “ecological approach” to national forest management. “New Perspectives” was renamed “ecosystem management” and various efforts were made to institutionalize it and distinguish it from the multiple-use sustained-yield management approaches of the past. The move to ecosystem management by the Forest Service and other federal land-managing agencies occurred in the absence of explicit statutory authority. Rather, it was an administrative response to a variety of factors, the most important being the requirements of the ESA and court cases brought to enforce it. Thomas repeatedly asked political leaders in Congress to legislatively affirm or deny if it was their intent that the national forests be managed primarily for biodiversity, and if so (or if not), prescribe the sideboards. Such clarification never came. Due to the lack of social consensus as to how national forests should be managed, a tendency developed for the Forest Service, other federal agencies (such as the U.S. Fish and Wildlife Service), Congress and the courts to add process and procedure to national forest planning and decision-making. Consequently, national forest management became increasingly costly and time-consuming, while providing considerable opportunity for individuals and interest groups to delay or block proposed actions. The term “process gridlock” thus came into use. 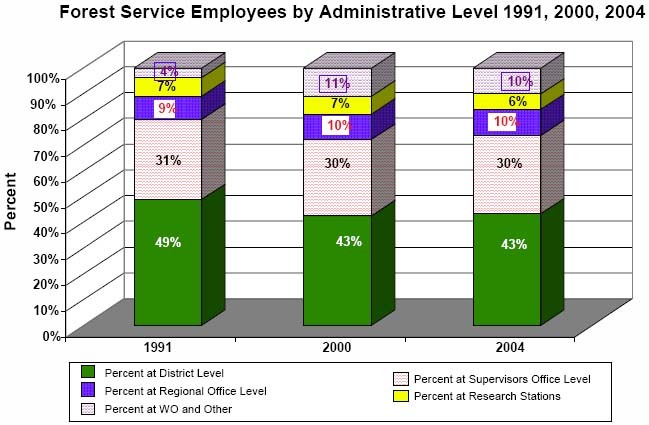 Many Forest Service employees, who previously had prepared projects in the field, had to be shifted to conduct environmental analyses, respond to administrative appeals and support related work.29 This led to an increase in the number of staff in forest supervisors’ offices, regional offices and the Washington Office at the expense of district field offices. It also extended the time needed to arrive at final management decisions. Regulatory agencies, given their missions, will always opt to accept as little short-term risk as possible and be relatively indifferent to long-term dynamic changes in the ecosystem in question. Multiple-use oriented agencies, given their missions, will usually opt for greater short-term risk with a longer-term view. The regulatory agencies’ cards trump those of the land management agencies. Too often, the Forest Service is so busy meeting procedural requirements, such as preparing voluminous plans, studies, and associated documentation, that it has trouble fulfilling its historic mission: to sustain the health, diversity, and productivity of the nation’s forests and grasslands to meet the needs of present and future generations. Too often the paralysis results in catastrophe. The role of public participation in federal land management planning evolved considerably over the decades. In the 1950s and 1960s, district rangers or forest supervisors (usually after informally sensing acceptance in the local community) would typically announce decisions that they had determined to be in the best interest of the national forests, its customers and stakeholders. The 1970s environmental laws, particularly NEPA and NFMA, directed federal land-managing agencies to increase formalized public participation substantially and mandated more open and “transparent” consideration and evaluation of a full range of management alternatives. These laws also increased the legal standing available to stakeholders to sue federal managers in court to enforce compliance with both the procedural and the substantive requirements of these laws. In response, a “rational planning model” evolved, based on an objective of seeking to optimize the various multiple uses and objectives using estimated values for market and non-market uses (Bowes and Krutilla 1989). The approach was also premised on a rather optimistic assumption that federal agency decisions arising from it would lead to a working consensus among diverse stakeholders and that such stakeholders would consent to share the land and resources under a politically acceptable social contract. In retrospect, the premise was overly optimistic. In recent years, a new agency role has emerged in which the Forest Service has shifted from being a “mediator” (receiving public input and deciding how best to weigh it in decision-making) to encouraging competing interests to sit down and “reason together” to find ways to accommodate their diverse objectives. This sometimes even includes stakeholders assisting in the design of vegetation management projects. The agency’s role in this case is similar to a “facilitator,” rather than mediator. While the decision still rests with the agency, the theory behind this approach is that it will lead to more informed decisions having broader public support than in the past. Experience suggests that this approach works best at the local level where the effect of alternative management approaches on specific areas of land can more easily be visualized. This new role places greater emphasis on effective collaborative skills in dealing with the public and other public agencies. It also relies heavily on forging partnerships to carry out some of the tasks traditionally done directly by the agency itself. It has resulted in an increasing focus on community-based efforts in national forest public involvement. Barriers and questions still remain regarding this emerging approach. For one thing, active engagement in collaborative decision-making is often discouraged as a result of subsequent administrative appeals and litigation. A second issue arises because federal lands are involved. How to address and balance local versus national interests in the use and management of federal lands is a particularly intractable issue with no easily applied solutions. This conflict is sometimes described as the problem of balancing the interests of “communities of place” with “communities of interest”. As local communities become more economically and socially diverse, this can become less of a problem. FROM MODEL FEDERAL AGENCY TO ADMINISTRATIVE PARALYSIS — WHAT HAPPENED AND WHAT OPTIONS ARE AVAILABLE? Living and working in rural areas, many Forest Service staff failed to read or understand the signals coming from urban areas. In addition, the demands of urbanites were often perceived to conflict with the interests of rural communities whose economies were tied to commodity use. Another major factor that worked against change was the Congressional budgeting process, which encouraged and directed the agency to maintain high levels of commodity outputs. Various opinions have been expressed about what should be done to reduce the polarization related to management of federal multiple-use lands. Some observers feel that the key to improving public agreement lies in effectively managing the transition to vegetation management practices specifically designed to maintain healthy forests and watersheds. Others feel that the key is to improve and make more inclusive and transparent public involvement and participation processes in federal planning decisions. Still others call for more incentives for interest groups to get involved during the planning process by reducing administrative and legal opportunities for such groups to intervene outside the process. Finally, there are some people who believe that entirely new administrative arrangements are called for, such as transferring all federal forest lands to the states, the private sector, national parks, or some combination thereof. Few concrete proposals have arisen in response to these ideas, however. The shift in focus and mission within the Forest Service in recent years has occurred at the same time as concerns have grown over the ecological health of significant areas of the national forests (Sampson and Adams 1993; USDA/Forest Service 1993; GAO 1999). A multiyear drought in the western United States, coupled with a multidecade buildup in forest density and forest fuels, has led to a significant increase in unusually severe wildfires (with consequent damage to sensitive watersheds, ecological values and adjacent communities). The increased incidence of severe fires is entirely coincidental to the recent mission shifts within the Forest Service, but it has created a strong sense of new direction and urgency for the agency as a replacement for its previous focus. Many observers believe that the twin problems of fuel buildup and declining forest health, and their effects on ecosystem diversity and sustainability, will be the most significant environmental challenges facing national forest managers in the early twenty-first century (Sampson and Adams 1993; Clark and Sampson 1995). Federal land managers estimate that over 40 million hectares of federal forest lands are at unnaturally high risk of catastrophic wildfires and large-scale insect and disease outbreaks because of unhealthy forest conditions (Senate Agriculture 2003). An additional risk factor is the major expansion of residential development into rural areas, often adjacent to national forest lands. This has created a new and growing local and community constituency that supports thinning and restoration of forests to reduce the risk of severe wildfires. 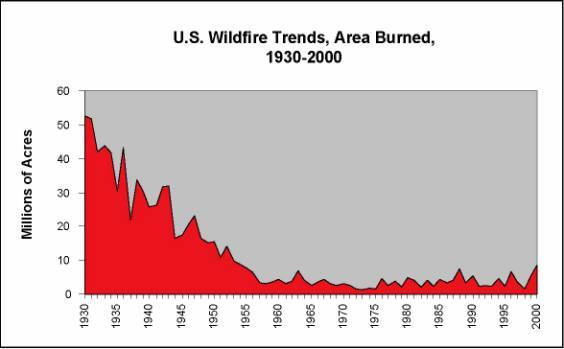 Many areas in western states that were subject to frequent, low intensity non-lethal fires in the nineteenth century are now at risk from uncharacteristically intense and destructive wildfires (Figure 5) (Arno and Allison-Bunnell 2002; Sampson and Adams 1993; Pyne 1984). The buildup of forest fuels is often attributed to the success of modern fire control. The reality is that a significant reduction in ecosystem fires in many parts of the western United States already occurred in the 1870s and 1880s, predating modern fire control by more than 50 years. This reduction in the number and extent of ecosystem fires was associated with the elimination of burning by indigenous peoples and the introduction of large numbers of livestock, which changed fuel dynamics and often prepared a mineral seed bed for forest regeneration (Arno 1985; Gruell 1985; Pyne 1984). Modern fire control, which became increasingly effective after 1930, exacerbated the problem. In late 2003, Congress passed the Healthy Forest Restoration Act (HFRA), which reduced some statutory process requirements associated with treatment and reduction of forest fuels and efforts to restore forests (including the relaxation and expedited processing of some NEPA requirements). As a result of these process reforms, the area of forest lands where fuel reduction and restoration activities have been carried out has increased substantially in the past five years. The shift in power from local communities (whose economies were heavily dependent on national forest commodity resources in the past) to national and regional special interest groups, that progressively took place from the 1970s through the 1990s, left many local communities feeling they had little voice in determining their own future (Lee 1994). Under President George W. Bush, various efforts have been made to re-empower local communities and increase their influence over national forest management decisions. These efforts are referred to as “collaborative conservation” or “collaborative governance”. Two caveats should be noted with respect to these efforts to re-empower local communities. The first is that these efforts are based almost entirely on administrative action, which could be reversed by a future Administration. Whether or not this happens may depend on whether broad bipartisan support for local community re-empowerment emerges. The second is that these efforts leave unresolved the issue of effectively balancing national and local interests in managing federal lands, with the possibility of national interests again reasserting a dominant position. 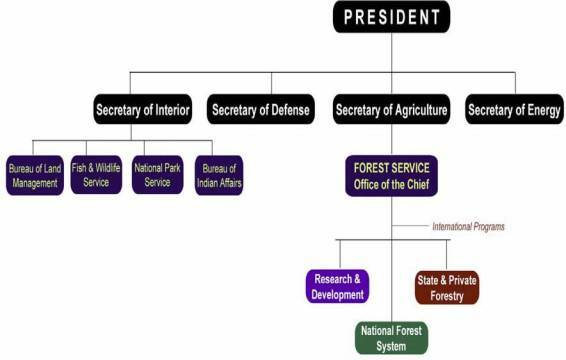 Over the years, many proposals have been made to change to the Forest Service’s organizational structure, but very few have been adopted and the organizational structure of the agency remains much the same as it was 50 years ago (Figure 1). The most frequently proposed changes have been to move the responsibility for administration of the national forests back under the DOI or, alternatively, to combine the Forest Service, DOI land-managing agencies and other federal land-managing agencies (such as the Corps of Engineers) under a new federal Department of Natural Resources (DNR) (Williams 2004). The first proposal to move the national forests back to the DOI came in 1911 only six years after the forest reserves were moved to the USDA and subsequent proposals have been advanced regularly since that time. Opposition by Forest Service stakeholders and resistance from within the ranks of the agency has always been sufficient to block the implementation of these proposals. Those organizational changes or “re-inventions” that have been implemented have come largely in response to shifting demands and have occurred in an incremental fashion, rather than the result of major strategically directed changes in the Forest Service organization chart. Many changes have come about in response to increasing or decreasing funding and Congressional appropriations and mandates. The field organization of the Forest Service — especially ranger districts and forest supervisors’ offices — has often successfully re-organized itself to become more integrated, and various field offices have been consolidated to improve efficiencies. In the western United States, many adjacent national forests have been combined under a single forest supervisor’s office. In the eastern part of the country, it is not uncommon for all national forests in one state to be administered by a single administrative office. Such efforts have often been initiated locally or in regional offices in response to shifts in funding or public demands (most often with headquarters’ encouragement and concurrence), rather than being directly orchestrated nationally. The sharp decline in timber sales resulting from implementation of the Northwest Forest Plan caused a major downsizing of Forest Service programme offices and employees in the Pacific Northwest. Within the area covered by the plan, Forest Service permanent full-time employee equivalents (FTEs) declined by 36 percent between 1993 and 2002, from 8 431 to 5 365 (Figure 6). Several individual national forests saw declines in FTEs of more than 50 percent during this period. In addition to downsizing in the Pacific Northwest, various other re-invention ideas were developed and formally proposed by the Clinton Administration. During President Clinton’s first term, a major “re-inventing government” effort led by Vice-President Al Gore (called the “National Performance Review”) sought to streamline and reform federal agencies, including the Forest Service. The National Performance Review re-invention proposal for the Forest Service included several elements (USDA/Forest Service 1994a), but the only one that was eventually adopted was the “enterprise team” concept.34 With a Republican-controlled Congress, the government-wide re­inventing programme became politicized and no proposals that required Congressional concurrence were implemented. Studies are currently evaluating outsourcing options for many Forest Service activities. These include communications, aviation management, training, engineering design, environmental data collection and analysis, safety and occupational health, and many others. About 21 180 full-time employees, or more than two-thirds of the Forest Service’s total FTE positions, are now being analysed for possible outsourcing (Wilent 2006). Like past government re-invention efforts, only time will tell how effective the current efforts will be. In the meantime and not surprisingly, the current competitive sourcing evaluations have created considerable anxiety within the agency workforce (Wilent 2006). Since the 1980s, in spite of a precipitous drop in national forest timber sale levels, the total number of permanent full-time employees in the Forest Service has remained relatively stable, at around 30000. Appropriated levels of funding for the three branches of the Forest Service have also remained relatively stable since 1990 (but have declined in inflation-adjusted terms). 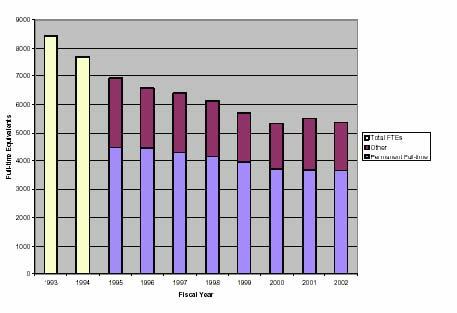 A major exception has been a major increase in funding for fire and treatment of forest fuels (Figure 7). 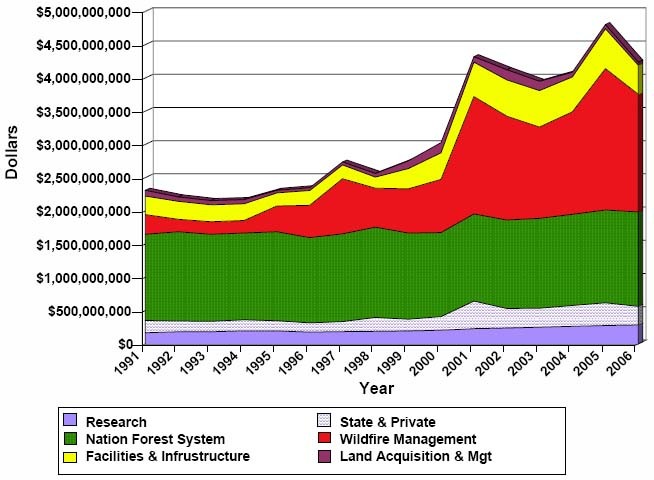 Source: Forest Service Budget Summary (1991–2006), USDA/Forest Service. The systematic application of adaptive management has not occurred for a variety of reasons, including a lack of commitment to and funding of needed inventories and monitoring. But there are also inherent cultural and institutional barriers, as well, both within land management and regulatory agencies, including the Council on Environmental Quality (CEQ). As an example, the Northwest Forest Plan established ten so-called “Adaptive Management Areas” (AMAs), covering about 600 000 hectares, which were intended to be laboratories for testing innovative management practices. In spite of the opportunity to showcase the application and utility of the concept of adaptive management, most observers feel that this effort has failed miserably (Thomas 2003, Stankey et al. 2003). The short-term risk intolerance common to federal regulatory agencies, which has been discussed previously, remains a major barrier to adaptive management. In addition, the courts have been unwilling to reduce what they consider to be the legal obligations of land management agencies to carry out detailed predecision analysis. …agencies have an incentive to overstuff the EIS with information from every available source, regardless of its quality, so as to achieve a protective layer of redundancy or “overkill” while at the same time inoculating themselves against the charge that they overlooked relevant information…NEPA ambitiously, and naively, demands the impossible: comprehensive, synoptic rationality, in the form of an exhaustive, one-shot set of ex ante predictions of expected environmental results. In the normal course of events, that task proves insuperable. In addition to discouraging adaptive management, current NEPA procedures can also discourage constructive and effective stakeholder collaboration. Collaboration is most effective if the Forest Service effectively engages all interested stakeholders in seeking to craft decisions that maximize joint objectives and interests. But NEPA procedures require that, even after the Forest Service has gone through this collaborative process, it must: (1) spend a year or more preparing voluminous documents evaluating in detail the environmental implications of a full range of alternatives; and (2) then ask for formal public comment on this range of alternatives, even after the collaborative process has successfully narrowed or eliminated many, if not most of them from active consideration. Not surprisingly, the stakeholder community often feels confused, betrayed and abandoned by this required NEPA process. In spite of the apparent conflict with the evolving science and application of ecosystem management, adaptive management and collaboration, the CEQ continues to staunchly defend its 1970s-era regulations implementing NEPA. A variety of challenges face the Forest Service in the early twenty-first century. Some of these are briefly summarized hereunder. Loss of technical skills. Since the Forest Service has not hired significant numbers of new employees for two decades, the agency is faced with an ageing workforce. Many employees are within five years of retirement (Figure 8). Reduced resources at the field level. Increased process demands have resulted in increased staff numbers at the upper levels of the Forest Service. As the agency’s budget has declined in real terms, its field offices working on the ground have been disproportionately affected (Figure 9). National forest field units are consequently stressed and stretched to meet the demands being placed on them. Lack of integration and turf wars. Agency turf wars are hindering integration. In the past, the roles of traditional functional areas in the Forest Service were relatively well-defined. They corresponded to each of the traditional multiple uses. Thus, the timber staff prepared and administered commercial timber sales, the fire staff prepared for and fought forest fires, the watershed and wildlife staff reviewed and commented on proposed projects, helped prepare environmental documentation and carried out watershed and wildlife restoration projects. With the agency focus on forest restoration and treatment of forest fuels, traditional lines of responsibility have become blurred. A timber sale, formally the responsibility of the timber staff (and funded by a timber sale budget line item), may now be the mechanism to reduce forest fuels — a task which was previously the responsibility of the fire staff (funded by the fire budget line item). The same activity may also advance the objectives of restoring watershed conditions or enhancing wildlife habitat (under the purview of the watershed and wildlife staffs, respectively). It has sometimes been difficult for the existing functional disciplines — with their traditional budget line funding from Congress — to rationalize and clarify their roles under the new mission focus. Considerable integration has occurred at the field level, but the turf battles and responsibility issues remain contentious at regional offices, and especially at the Washington Office level. Undefined social constituency for ecosystem restoration and fuels’ treatment. At present, there is no well-organized national constituency for forest restoration and treatment of forest fuels. Some of the current national forest constituencies, such as the timber industry and wilderness interests, are cool to this new mission focus, or even opposed. For others, such as recreation stakeholders, the issue is considered peripheral to their primary interests. A constituency for restoration and fuels’ treatment may now be emerging at local community levels, but it has yet to emerge as a national political force. Since 1905, the management of national forest lands has shifted from custodial management (1905– 1945), to production of wood products (1945–1985), and most recently to a still evolving form of ecosystem management that emphasizes restoration and maintenance of forest health, reduction of hazardous fuels, biodiversity and recreation. The most recent shift was rapid, although it was often resisted both within and outside the Forest Service. The Forest Service has made these significant changes in its mission focus within an overall organizational structure that has remained largely unchanged since the 1930s. In addition, the substantial changes in mission focus since 1985 have occurred without an explicit change in the statutory mandate governing the purposes for which the national forests are to be managed. While numerous formal proposals to re-organize and restructure the Forest Service have been made over the years, few have been implemented. Those restructurings that have occurred have mainly involved consolidation of management units, largely initiated by field offices in response to shifts in funding and budgets. The Forest Service as an organization has demonstrated both rigidity and flexibility over the years. In response to changing legal requirements and public demands, the Forest Service has been able to “re-invent” itself by making substantial changes in its mission focus. Such changes have not always been easy for the agency, especially when they ran counter to the organizational culture or adversely affected key Forest Service stakeholder groups. Strong leadership of the agency by career employees who worked their way up through the organization has been a major positive factor in formulating workable responses to shifting demands on the agency. The decentralized decision-making culture of the agency has also been a strength, allowing the agency to adapt to changing needs at local levels. A major barrier that remains to the Forest Service becoming a true learning organization is that the regulatory agencies that oversee it, and the courts that review legal challenges against it, have yet to embrace the concept of adaptive management. This has prevented the Forest Service from adjusting management approaches and strategies as quickly as hoped in response to lessons learned on the ground. The performance and evolution of multiple use in any specific context depends on a variety of factors, not the least of which is: (1) the nature and intensity of the demands being placed on the land; (2) the nature and scope of the stakeholders or constituencies interested in that management; and (3) the “rules of engagement” that apply to public input and intervention into the decision-making process. The experiences in managing the national forests suggests strongly that key land allocation decisions, especially between protected lands, such as wilderness, and land used to produce a broader range of goods and services (e.g. timber), should be recognized as essentially political decisions and, therefore, should not be left to professional land management agencies to resolve. The unwillingness of Congress to make these decisions, or, alternatively, to set clear limits or parameters on the area of protected and/or production lands, has often left the Forest Service in an untenable situation. In the early twentieth century it was widely assumed that public ownership and management of forest lands was needed to assure that they would be managed effectively for watershed protection and sustained timber production. Today 92 percent of the timber produced in the United States is harvested from private land (USDA/Forest Service 2004). In fact, it can be argued that the existence of public forests designated for multiple-purpose use is contrary to the objective of timber production because it encourages the kinds of public debates and controversy described in this study. As demands for non-timber uses and values on these lands increased, timber production shifted to other forests and to other countries. Factors contributing to expanded private investment in forestry in the United States include: (1) stable and well-defined institutional frameworks and land tenure and land rights systems, backed by the rule of law; (2) strong and relatively consistent markets for forest products; (3) strong agricultural and forestry institutions and support and delivery systems at national, state and local levels; and (4) increasing per capita income and other measures of economic strength and diversity that encourage investment in the forest sector and result in citizens who cherish forests for their non-timber and environmental values (MacCleery 2001). The decision to establish a federal system of forest reserves in the United States was fateful. It created a perceived right and interest among all citizens on how these lands should be managed. If federal forest lands in the United States had been transferred to the jurisdiction of individual states, the changed political dynamics would have resulted in a substantially different policy evolution. Whether it might have been better or worse depends on one’s viewpoint. There is no question that the existence of a large federal land estate has led to a sizeable body of federal laws governing their management, as well as the requisite federal land management agencies to administer them. Together, these elements created a public forest policy-making structure heavily concentrated in Washington. As the demands being placed on these lands increased over time, diverse constituencies emerged with a stake in how these lands were to be managed; they organized themselves to influence Congress and federal agencies in Washington to achieve their particular objectives. As a significant portion of this constituency is disconnected from the economic impacts of reduced federal commodity production, it should be no surprise that such a shift has occurred in recent years. Fierce in battle, many of the eco-warriors have been unable to come to grips with the consequences of victory and are now reduced to wandering about the old battlefields bayoneting the wounded. Their counterparts from the resource extraction community, likewise, cannot come to terms with defeat and hold “ghost dances” to bring back the good old days when they were undisputed Kings of the West. Some emerging signs are promising. In a recent opinion piece in Grist magazine, Mitch Friedman, one of Jack Thomas’ “eco-warriors” on the Pacific Coast suggested that it is time for the environmental community to reconsider the newly re-invented Forest Service and change from confrontation to cooperation and collaboration.37 Friedman writes that the environmental community should “…push to thin overgrown stands before it gets charred. We need to get better at advocating restoration logging before fires occur”. If we want our forest ecosystems restored, we must now disabuse the Forest Service of the inefficiencies we helped impose. We must rescue the Forest Service by becoming its friend, its ally and its core constituency…. We have at hand an opportunity…to build a new conservation movement and a new Forest Service to advance a new central idea of restoration. Only time will tell how well Friedman’s challenge will be taken up by other national forest stakeholders. It still remains to be seen whether Chief McGuire’s “grand experiment” wherein diverse interests consent to “share the land” is a viable approach for multipurpose public land in an era of representative democracy characterized by diverse and fiercely competing special interest groups. Apple, D.D. 1997. Changing social and legal forces affecting the management of national forest lands. Women in Natural Resources, Vol. 18, No. 1, Autumn 1996. Arno, S.F. 1985. Ecological effects and management implications of Indian fires. In Proceedings: Symposium and workshop on wilderness fire. 15–18 November 1983. Missoula, MT. Ogden, Utah, Intermountain Forest and Range Experiment Station, General Technical Report INT­182, USDA/Forest Service. Arno, S.F. & Allison-Bunnell, S. 2002. Flames in our forest: disaster or renewal? Washington, DC, Island Press, 227 pp. Babbitt, B. 1994. The Endangered Species Act and “takings”: a call for innovation within the terms of the act. Environmental Law, 24(2): 355–67. Bowes, M.D. & Krutilla, J.A. 1989. Multiple-use management: the economics of public forestlands. Washington, DC, John Hopkins University Press for Resources for the Future. 357 pp. Brooks, D.J. 1993. U.S. forests in a global context. USDA/Forest Service, General Technical Report RM 228, 7/93. (Online at: http://svinet2.fs.fed.us/pl/rpa/93rpa/93pub.htm). Brown, H. & Williams G. 2001. Crossing the divide: Forest Service milestones in the 1980s. Washington, DC, USDA/Forest Service. Carson, R. 1962. Silent spring. Boston, Houghton Mifflin Co.
Census. 1975. Historical statistics of the United States from colonial times to 1970, Bicentennial edition, Part 1. U.S. Department of Commerce, Bureau of the Census, Washington, D.C.
Census. 1970–1990. Characteristics of new housing: current construction reports. Series C25. Compilation of 1970-90 C25 reports. Washington, DC: U.S. Department of Commerce, Bureau of the Census. Census. 1994. Statistical abstract of the United States, 1994. Washington, DC, U.S. Department of Commerce, Bureau of the Census. Census. 2000. Characteristics of new housing: 2000. 2000 C25 report, Table 16. Washington, DC, U.S. Department of Commerce, Bureau of the Census. Clark, L. & Sampson, R.N. 1995. Forest ecosystem health in the inland west: a science and policy reader. Washington, DC, Forest Policy Center, American Forests. Domestic Policy Council (DPC). 1988. Outdoor recreation in a nation of communities: action plan for Americas outdoors. A Report of the Task Force on Outdoor Recreation Resources and Opportunities to the Domestic Policy Council, Washington, D.C. 6/88. Environmental Protection Agency (EPA). 2001. Latest findings on national air quality: 2000 status and trends. Environmental Protection Agency, Washington, D.C. September 2001. (Online at: http://www.epa.gov/air/aqtrnd00/index.html). Fairfax, S.K. 1978. A disaster in the environmental movement. Science, 17 February 1978: 743– 748. Fedkiw, J. 1989. The evolving use and management of the nation’s forests, grasslands, croplands, and related resources. USDA-Forest Service, General Technical Report RM 175, September 1989. Fedkiw, J. 1999. Managing multiple uses on national forests, 1905-1995. Washington, DC, USDA Forest Service. FS-628. 284 pp. Forest Options Group (FOG). 1999. Second century: options for the Forest Service. A report to the American people by the Forest Options Group, January 1999. Online at: http://www.ti.org/ 2c.html. Franklin, J. 1989. Toward a new forestry. American Forests (November–December, 1989). Franklin, J. & Forman, R. 1987. Creating landscape patterns by forest cutting: ecological consequences and principles. Landscape Ecology 1(1987): 5–18. G. 1981. Ecological characteristics of old-growth Douglas-fir forests. Gen. Tech. Rep. PNW­GTR-118. Portland, OR, U.S. Department of Agriculture, Forest Service, Pacific Northwest Research Station. 48 pp. Online at: http://216.48.37.142/pubs/viewpub.jsp?index=5546. Gruell, G.E. 1985. Indian fires in the interior west: a widespread influence. In Proceedings: Symposium and workshop on wilderness fire. 15–18 November 1983. Missoula, MT. Ogden, Utah, Intermountain Forest and Range Experiment Station, General Technical Report INT­182, USDA/Forest Service. Grumbine, R.E. 1994. What is ecosystem management? Conservation Biology, 8: 27–38. Howard, J.L. 2003. U.S. timber production, trade, consumption, and price statistics 1965 to 2002. Res. Pap. FPL-RP-615. Madison, WI, U.S. Department of Agriculture, Forest Service, Forest Products Laboratory. 90 pp. Human Resources Management (HRM). 2006. Workforce data reports from NFC. Human Resources Management, USDA/Forest Service. Johnson, N.C. Malk, A.J., Szaro, R.C. & Sexton, W.T., eds. 1999. Ecological stewardship: a common reference for ecosystem management, Elsevier Science Ltd., Oxford. On-line reference at: http://www.elsevier.com/wps/find/bookdescription.cws_home/601491/description#description. Karkkainen, B.C. 2002. Toward a smarter NEPA: monitoring and managing government’s environmental performance. Columbia Law Journal (May 2002) p. 102, Colum. L. Rev. p. 903. Kaufman, H. 1960. The forest ranger: a study in administrative behavior. Baltimore, MD, John Hopkins Press. Kennedy School. 1994. What if we could start over: the US Forest Service champions “bottom­up” management. John F. Kennedy School of Government Case Program. Case: C16-94­1246.0. Harvard University, Cambridge. Massachusetts. Kessler, W.B., Salwasser, H., Cartwright, C.W. Jr. & Caplan, J.A. 1992. New perspectives for sustainable natural resources management. Ecol. Appl. 2, 221–225. Kuusela, K. 1994. Forest resources in Europe 1950-1990. European Forest Institute, Research Report 1. Cambridge, UK, Cambridge University Press. Lee, R.G. 1994. Broken trust, broken land: freeing ourselves from the war over the environment. Wilsonville, Oregon, Book Partners, Inc.
MacCleery, D. 2001. Pathway to sustainability: defining the bounds on forest anagement, by John Fedkiw, Douglas W. MacCleery, and V. Alaric Sample. Durham, North Carolina, Forest History Society. MacCleery, D.W. & Le Master, D.C. 1999. The historical foundation and evolving context for natural resources management on federal lands. In W.T. Sexton, R.C. Szaro, N.C. Johnson & A.J. Malk, eds. Ecological stewardship: a common reference for ecosystem management, pp. 517–556. Oxford, Elsevier Science Ltd.
Office of Personnel Management (OPM). 2006. 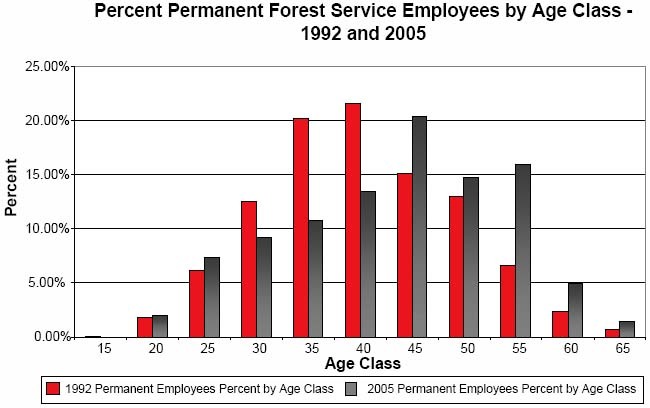 Breakdown of Forest Service employment by job series – 1973, 1983, 1993, 2003. Washington, DC. Office of Personnel Management. Pyne, S.J. 1982. Fire in America: a cultural history of wildland and rural fire. Princeton, NJ, Princeton University Press. Robertson, D. 1992. Memo from Dale Robertson to regional foresters and station directors entitled “Ecosystem Management of the National Forests and Grasslands.” Washington Office, USDA/ Forest Service, June 4, 1992. Salwasser, H., MacCleery, D.W. & Snellgrove, T.A. 1993. An ecosystem perspective on sustainable forestry and new directions for the U.S. national forest system. In G.H. Aplet, N. Johnson, J.T. Olson & V. Alaric Sample, eds. Defining sustainable forestry, pp. 44–89. Covelo, CA, Island Press. Sampson, R.N. & Adams, D.L., eds. 1993. Assessing ecosystem health in the Inland West. Overview papers from an American Forests scientific workshop. 14–19 November 1993, Sun Valley, ID. Washington, DC, American Forests. Senate Agriculture. 2003. Report on the Healthy Forests Restoration Act (H.R. 1904). Senate Agriculture Committee. November 2003. U.S. Congress. Society of American Foresters (SAF). 1993. Taskforce report on sustaining long-term forest health and productivity. Bethesda, MD. Cited in: Forest of discord: options for governing our national forests and federal public lands, 19–20. Bethesda, MD, Society of American Foresters. 1999. 84 pp. Stankey, G.M., Bormann, B.T., Ryan, C., Shindler, B., Sturtevant, V., Clark, R.N. & Philpot, C. 2003. Adaptive management and the Northwest Forest Plan: rhetoric and reality. Journal of Forestry, Vol. 101, No. 1, January/February 2003. Steen, H.K. 1976. The U.S. Forest Service: a history. Seattle, Washington, University of Washington Press. Thomas, J.W. 2001a. Testimony in hearing before the subcommittee on forests and forest health on “Conflicting Laws and Regulations – Gridlock on the National Forests”. 25 October 2001. Washington, DC, U.S. House of Representatives. Thomas, J.W. 2001b. Testimony in a hearing on the Northwest Forest Plan on October 24, 2001 before the Senate Subcommittee on Public Lands and Forests of the Committee on Energy and Natural Resources. U.S. Senate, Washington, DC. Thomas, J.W. 2004. The journals of a forest service chief (Harold K. Steen, ed.) Durham, NC, Forest History Society and Seattle, WA, University of Washington Press. Trefethen, J.B. 1975. An American crusade for wildlife. New York, NY, Winchester Press and the Boone and Crockett Club. Twight, B.W. 1990. Bernhard Fernow and Prussian forestry in America. Journal of Forestry, 88 (2): 21–25. USDA/Forest Service. 1971. National forest management in a quality environment: timber productivity. Washington, DC, U.S. Forest Service, 1971. 61 pp. USDA/Forest Service. 1993. Report of the Forest Service – fiscal year 1992. Washington, DC. 2/93. USDA/Forest Service. 1994. The Forest Service ethics and course to the future. FS-567. Washington, DC. 1994. USDA/Forest Service. 1994a. The reinvention of the Forest Service: the changes begin. 6 December, 1994. Washington, DC. USDA/Forest Service. 2001. Forest resources of the United States, 1997. General Technical Report NC-219, St. Paul, MN, North Central Research Station. USDA/Forest Service. 2003. National review of silviculture continuing education and silviculture certification programs: phase one team report. Forest Management Division, National Forest System. USDA/Forest Service, Washington, DC, 2003. USDA/Forest Service. 2004. Forest resources of the United States, 2002. General Technical Report NC-241, St. Paul, MN, North Central Research Station. USDA/Forest Service. 2004a. Forest Service performance and accountability report – fiscal year 2003. USDA/Forest Service, Washington, DC. April 2004. USDA/Forest Service. 2005. National forest cut and sold reports, FY 1950 to date, USDA/Forest Service, Washington, DC. USDA/Forest Service & USDI/Bureau of Land Management. 1994. Final supplemental environmental impact statement on management of habitat for late-successional and old-growth forest related species within the range of the northern spotted owl. Portland, Oregon. U.S. Department of Commerce. 2001. Bureau of Economic Analysis, July 2001. U.S. Senate. 1972. Clearcutting on federal timberlands. Committee on Interior and Insular Affairs, Subcommittee on Public Lands. Committee Print. 92nd Cong., 2nd Sess. Washington, DC, U.S. Govt. Print. Off., Mar. 1972. 13 pp. USTR (Office of the U.S. Trade Representative). 1996. U.S. and Canada Reach Agreement on Softwood Lumber. Press release, 16 February, 1966. Washington, DC, Executive Office of the President. 4 pp. Walters, C. 1986. Adaptive management of renewable resources (New York, MacMillan Publishing Company), and C. Walters & C.S. Holling, Large-scale management experiments and learning by doing. Ecology 71 (1990). Williams, M. 1989. Americans and their forests: a historical geography. New York, Cambridge University Press. Williams, G.W. 2002. The multiple use-sustained yield act. Washington, DC, USDA/Forest Service, 7/12/2002. Williams, G.W. 2004. Forest Service organization and reorganization: past to present. Washington, DC, USDA/Forest Service, 12/13/2004. Williams, G.W. 2004a. FS employees 1891 to present. Washington, DC, USDA Forest Service, History Program. Zhang, D. 2000. Endangered species and timber harvesting: the case of red-cockaded woodpeckers. Auburn, Alabama, Forest Policy Center, School of Forestry and Wildlife Sciences, Auburn University. 2 The United States Civil War (1861–1865), the bloodiest conflict in the country’s history, was fought, in part, over whether individual states had the right to withdraw from the Union into which they had voluntarily entered at the conclusion of the Revolutionary War of 1776 to 1782. The outcome of the war determined that the answer was “no”. 3 Although reasonable at the time, this assumption has since proven invalid. Owing to rising real prices for wood products and a favourable tax and related institutional climate that encourages investments in timber-growing practices, private forests now account for 92 percent of national timber harvest, while also providing high levels of watershed protection (USDA/Forest Service 2004). 4 In 1907 the forest reserves were renamed “national forests”. 5 Over time, one of the largest federal land-managing agencies has been located in the Department of Agriculture, while almost all other land-managing agencies are located in the Department of the Interior (DOI); this led to many proposals to either shift the Forest Service back to the DOI or to create a Department of Natural Resources within which all federal land-managing agencies would reside. None of these proposals has been implemented successfully. 6 Until the mid- to late 1970s, professional employees working for the national forests generally did not apply for job openings. Such promotions or transfers were offered with a strong expectation that they would be accepted. These usually required the employee and his or her family to move, often to remote locations. It was widely understood that if a particular employee turned down two such offers, the next one would be very long in coming, if ever. 7 Over the last several decades many adjacent national forests have combined administrative offices. 8 For example, today firefighters of the various federal and state agencies are trained to use standardized firefighting equipment and techniques. Federal, state and local agency firefighters from anywhere in the country can be mobilized, sent to emergency situations elsewhere in the country and operate effectively with standardized radio frequencies, equipment, terminology and training. 9 Required reforestation of logged areas is generally done by the Forest Service, usually using funds deposited into a special fund by the logging contactor. Federal agencies generally use private planting contractors and planting stock raised in federal nurseries. 10 Newsweek, 2 June 1952. 12 In 1975, legislation was passed to allow designation of wilderness areas in the eastern United States (DPC 1988). 13 Under the Equal Access to Justice Act, citizens and NGOs can be reimbursed for the costs of bringing litigation against the federal government if certain requirements are met. In contrast to many other countries, citizens and NGOs are not required to cover the government’s legal costs if the litigation brought by them is unsuccessful. 14 Some of the increase in permanent full-time employment during this period was due to conversion of temporary, wage grade employees to permanent full-time status. 15 In response to the national forest clear-cutting controversy, in March 1972, the Senate Subcommittee on Public Lands published a set of guidelines for clear-cutting on public lands (U.S. Senate 1972). These guidelines, called the “Church Guidelines” after Subcommittee Chair Frank Church of Idaho, were later incorporated into the statutory requirements of the NFMA of 1976 (Fedkiw 1999). 23 Dale Robertson had begun the process of agency re-invention even before he became Chief (in his position as Associate Chief under Chief Max Peterson). 27Although a career Forest Service employee, Thomas did not undergo the senior executive training required of top career civil service positions. Therefore, he accepted his appointment as the first political appointee to be Chief since Gifford Pinchot and Henry Graves, based on the promise that he would later be converted to career civil service status. This never occurred. 28 For his account of the pressures he faced in responding to the demands of Congress and the Clinton Administration see The journals of a forest service chief (Thomas 2004). 29 Planning and environmental analysis was estimated to consume 40 percent of total direct work at the national forest level (USDA/Forest Service 2002). 30 The focus on short-term effects on forest resources, e.g. water quality and fisheries, is illustrated by the adverse ruling in Pacific Coast Federation of Fisherman’s Association V. NMFS, 253 F.3d 1137 (9th Cir. 2001).